The Playskool Explore and Grow Busy Ball Popper is a fun new toy for babies 9 months old up through toddlers around 3 years old. This will be the most fun for baby once she is able to sit up and play. 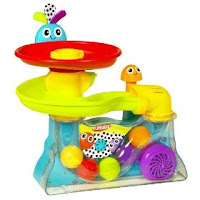 This toy teaches cause and effect as your child presses the big button to watch the 5 colorful balls move through the tube and then pop up from the top. This 55 second video commercial by Playskool shows kids playing with the new busy ball popper and explains some of the educational benefits of this type of toy.